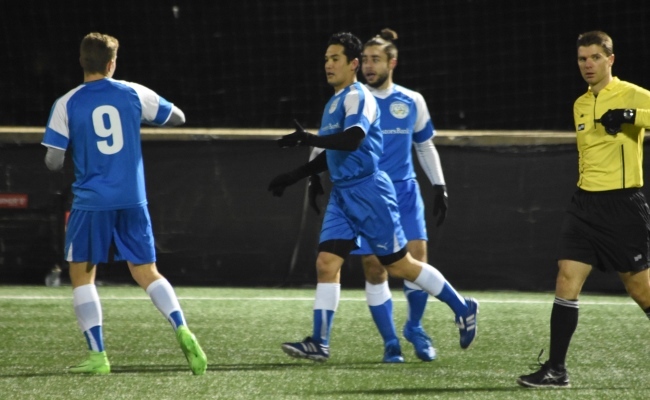 NY Pancyprian Freedoms outside midfielder Adam Himeno was selected Player of the Week for the third time this season after netting a brace and tallying three assists versus Central Park Rangers in a 6-1 win. Himeno was delighted to win the accolade for a third time this campaign and, as he mentioned after his previous nominations, noted how critical his teammates were in him winning the award. “I am proud to have win Player of the Week again but like I have said, I could not have done it without my teammates and their performance Saturday night,” the midfielder said. Himeno was previously selected Player of the Week for scoring a goal and providing one assist against NY Greek American in Week 5 and for netting a hat trick versus the Greeks in Week 13. The 30-year-old’s three assists against CPR last weekend were two square passes to ex-MLS Cup MVP Alecko Eskandarian and one to Luis Esteves. “It’s always great to contribute in a positive way during a game and I’m glad that my teammates finished the chances,” Himeno said about sending his fellow Pancyprians players on goal three times. The former St. John’s University player’s three assists against Central Park pushed him to eight CSL assists on the season. As for Himeno’s goals, he scored a header from Esteves’ cross and a right footed finish via Daniel Bedoya’s free kick. The Atlanta native hopped to third spot in the top scorers’ chart with 11 goals after his brace against Central Park. Himeno was pleased to go on target 11 times this season and register eight assists in 14 appearances but noted that there’s more to be done as the season is not yet over. The Freedoms have three matches left in the regular season. The club will take on Zum Schneider F.C on Sunday at 8:00 p.m. at Randall’s Island Field 70 before facing second placed Lansdowne Bhoys and ninth placed Doxa SC. NY Pancyprians sits in third place in the CSL standings. The Queens based club’s potential opponent in the playoffs is amateur champions Lansdowne. With only one league loss this season, Himeno expressed how important it is for the team to carry the form they’re in now into the playoffs. “I think it's vital to keep up the momentum we've had this season into the playoffs to make sure we achieve the goal of winning the championship,” he said. Cedar Stars Academy attacking midfielder Christopher Katona is the only player who owns more Player of the Weeks than Himeno, winning the accolade four times.